Designed for precision handling in dry environments, the ATG MaxiFlex uses AirTech technology to deliver 360 degree breathability. 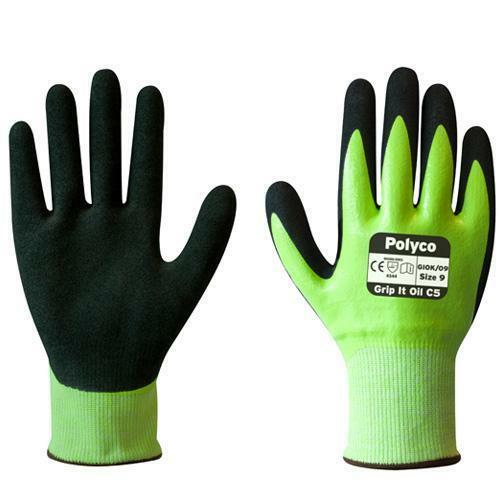 Ultra lightweight, nitrile palm-coated, excellent form-fit-feel, these are an ideal glove for DIY, maintenance, warehousing and gardening. Ultra-lightweight, knitwrist, Micro-Foam nitrile palm-coated glove. Minimal palm thickness and thinner than most comparable gloves. Class leading form, fit and feel, reducing hand fatigue and increasing comfort. ATG MaxiFlex Ultimate Palm Coated 34-874 Gloves conforms to: EN407 and EN388 Rated 4.1.3.1 (Abrasion 4, Cut 1, Tear 3, Puncture 1). A flexible and tough red PVC coating on a soft interlock lining. Open cut gauntlet makes removal easy. Design provides protection to the lower arm areas and wrist. Multi-purpose general handling in oily, wet or dry conditions. Phthalate free formulation and fully REACH compliant. Overall length is 27cm (11”). Overall length is 35cm (14"). Ultimate Industrial R135 Redek PVC Coated Gauntlet conforms to: EN388 4.1.1.1 safety standards. A flexible, soft glove that absorbs perspiration, for ultra-comfortable extended wear and with good mechanical resistance. 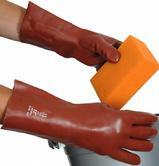 Seals and protects the hand against chemicals while remaining flexible. Impermeable for working in damp or greasy environments, enabling you to grip objects securely, surface provides tactile feel and better grip. Greater hygiene - no irritation by seams in contact with the skin, antibacterial and anti-odour treatment. 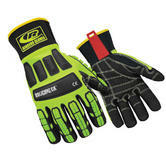 Mechanix Wear SFF-91-010 fast fit green large gloves have a high visibility reflective strip and hi-viz print enhance visibility. Elastic cuff delivers a secure fit and easy on/off flexibility. 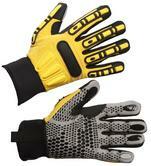 Made from a fluorescent ANSI-107 compliant TrekDry material helps keep hands cool and comfortable. Wide-opening elastic cuff makes it easy to pull on and off. The Phynomic 60060 from Uvex is perfectly suited for wet activities that require precision and maximum flexibility. 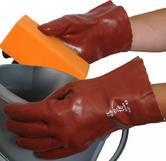 Zorb-IT® HV is one of the newest members of the flat-dipped sponge nitrile Zorb-IT® product line from Best Glove. This product has Maximum Oil Absorbency (MXOA). 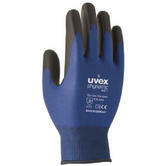 A light, elastic low-lint glove, resistant to deformation and which keeps its shape longer. 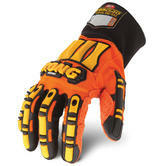 Protects the hand from oils, hydrocarbons, grease and abrasion, with optimal long lasting grip. Breathable back of hand to reduce perspiration. Surface provides the best grip, even in oily circumstances. No irritation by seams in contact with the skin. Great freedom of movement for the wrist. Increased safety in poor lighting conditions. 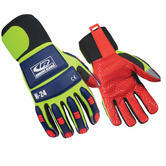 Showa Best 4570 Zorb-IT Hi Vis Glove conforms to EN388 4.1.3.1 safety standards. 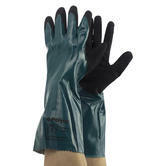 Honeywell 2299500 DeepBlue Winter Thermal Gloves are perfect for handling of oily or greasy parts in cold environment. Outdoor handling in wet environment. Assembly work in greasy/oily environment. Complies to EN 420 , EN 388 : 4121, EN 511 : X1X safety standards. 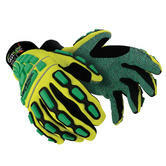 Lightweight Safety Glove in florescent yellow and green with twin layers nitrile coating provides extraordinary oily grip and top level cut resistance. Double coating: The first layer, which is a full coating, is soft and resilient allowing for excellent dexterity and great freedom of movement. The second layer, which is a palm coating, not only increases resistance to oils but has been engineered to provide maximum grip. Comfort: The contoured design together with the soft seamless knitted liner and resilient nitrile coating ensures ultimate comfort with minimal hand fatigue in prolonged use. 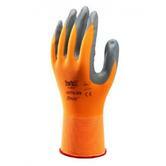 Polyco Grip It Oil C5 Men Cut 5 Resistant Work Gloves conforms to: EN 388 4.5.4.4. safety gloves standards. Seamless knitted chemical resistant gauntlet with dual nitrile coating. Polyco Grip It® C1 Oil Work Gauntlets conforms to: EN374-1:2003; EN374-2:2003; EN374-3:2003; EN388:2003 and EN420:2003+A1:2009, EN1186 standards. Available in size 9 only. Protects the hand and forearm from oils, hydrocarbons and corrosive substances with excellent grip. Tough, flexible unique patented Coral finish coating, especially formulated to provide the highest level of grip. Coral coating approved for food handling. Excellent durability and grip in dry, wet or oily conditions. Flared gauntlet for ease of removal. 35cm gauntlet with a seamless double wall HPPE liner. Breathable cotton liner to increase comfort, reduce perspiration and skin irritation. 100% PVC coating. 35% nylon / 32% cotton / 25% tsnooga / 5% spandex / 3% glass lining. Skytec XENON 5 Chemical Resistant Gauntlet conforms to: EN388: 2003 4.5.4.2; EN374-3: 2003; EN374-2: 2003. The 13-gauge knit shell is constructed with a blend of hightenacity fibers, that deliver CE Level 5 and ANSI A5 cut resistance. Thermoplastic Rubber (TPR) safeguards the user’s knuckles, fingers, metacarpals and thumb from common abrasion and impact injuries in hazardous work environments. The ORHD® Knit CR5A5 have extended the TPR protection to the tip of each finger for proven pinch-point protection from crushing injuries. Durable gripping power in dry, oily and wet conditions with anatomically padded and equipped with textured nitrile coating palm. Perfect for use in: Oil and Gas, Mining and Automotive industries, Industrial Environments and Heavy Equipment Operation. Conforms to EN388 Safety Standard Grades : 4.5.4.4. These Portwest A450 Thermal Protection Weatherproof Hi-Vis gloves are designed for use in the most demanding conditions. 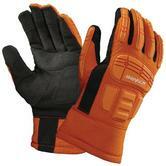 Thermal Protection gloves - Insulated liner and knitwrist keeps hands warm and dry. Tough double dipped PVC coating prevents oil, grease and water penetration. 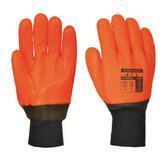 Portwest A450 Thermal Weatherproof Hi-Vis Glove conforms to: EN 420; EN 388 (3.1.2.1.) and EN 511 (1.2.1.). Following the expansion of Oil and Gas industry on a global scale, the number and kind of injury occurred during drilling activity has driven an increasingly safety conscious culture. Wrenching on a valve head, handling lumber, pulling cable, hauling tools, or moving piping, workers involved in the areas of drilling, transportation, construction and refining face the same problems, the protective gloves worn in other industries don't even come close to meeting the needs of. Northseaworkwear is a company consistently focused on providing the most innovative safety solutions to this particular sector, as result we achieved a unique specialist knowledge, so you can count on us as advisors and suppliers. When we hear from our customers about their needs and demands, we listen. Talking about impact protection, we understand that when the last line of defence is the gloves you wear; it has to be lab tested state-of-the-art. We learnt that roughly the 50% of hand injuries are cuts and punctures in the petroleum industry, so we selected gloves you can always relay on when handling sharp edges, metal burrs, wires or slivers commonly found in Oil and Gas production environment. Today you can choose between the Ansell 97-210 which provide unbeatable impact protection, the enhanced cut resistant Wenaas Odin Extreme or the classic Ironclad Kong, the first glove specifically designed for this industry.